Today's Watch for it Wednesday is a couple of quick and easy tips I have found helpful. The first is Goo Gone. Many of you probably have this on your shelf at home to remove the residue from price tags etc. I have found this cleans my scissors wonderfully. As I use my craft scissors to cut adhesive and mounting tape my scissors gum up over time. 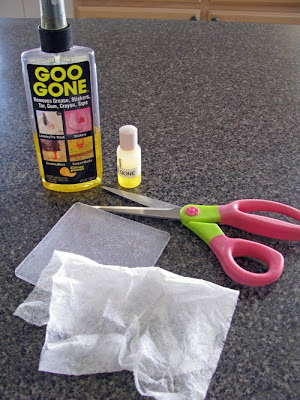 Goo Gone takes off the sticky like it was butter. I cleaned out a little sample bottle I had and put a little Goo Gone in it to keep in my craft room so I didn't have to find a place for a big bottle of it. The next tip is dryer sheets. are wonderful to use on your diecut mat to keep the pieces from clinging. I simply wipe off the mat every once in awhile when I notice static starting to develop. If you live in a humid area you may not have this problem, but here in Utah it's pretty dry. We'll see you back tomorrow for another wonderful layout from Ruth Ellen.